Get Rid of Dentures for Good! Get your smile back for good! Get rid of removable Dentures forever! The All-on-4 solution is attractive to patients wanting to get rid of their dentures, and to people with failing teeth in need of a full upper and/or lower restoration. This procedure, as the name implies, requires as few as four dental implants per jaw to support a fully customized set of replacement teeth. The All-on-4 treatment is provided while the patient is comfortably asleep using sedation dentistry, and the best part is that the patient receives a full provisional set of replacement teeth at the time of surgery in most cases. Our All-On-4 patients come to us from Aliso Viejo, Laguna Beach, Laguna Hills, Laguna Niguel, California and surrounding communities. If you are suffering with failing teeth or are tired of the daily challenges and repeat expenses associated with removable dentures and if it is your dream to just be able to eat a normal diet and smile in family photos, then the All-on-4 dental implant procedure may very well be the answer for you! This revolutionary procedure give patients new, beautiful and immediately functional teeth. Dr. Turner will be able to help you make that decision during your free consultation. He will need to asses your teeth, gums and mouth. Then, Dr. Turner will provide to you a number of treatment options, including All-on-4, to help you have a healthy, beautiful smile. At any point, Dr. Turner will answer your questions so that you can make the decision that is best for you. You typically receive your new provisional teeth on the same day as your surgery. They are non-removable and so they don’t shift around uncomfortably or fall out. You can enjoy most any food. This helps you remain healthy and well-nourished. You brush and clean similarly to natural teeth and they don’t need to be removed after meals or at night time. They are supported almost entirely by the jawbone and so don’t typically damage the gums, making them far more comfortable. They don’t require repeat expenses, such as messy adhesives, soaking and cleaning solutions, etc. They are custom designed to precisely fit the natural contours of the your mouth, so they feel comfortable and natural. They won’t trigger your gag reflex, like dentures tend to. Promote great jawbone health through the restoration of functional stimulation (via the implants) of the underlying bone tissue. They are very reliable if cared for properly with the right measure of home and professional care and attention. 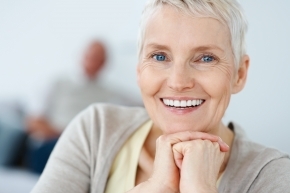 Still Have Questions About Dental Implants? Watch this video. This video explains the Implant Process. 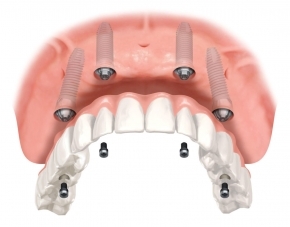 It is a great illustration for anyone who may have questions about the implant procedure. Looking for more information on Implants and All-On-4 in Aliso Viejo, Laguna Hills, Laguna Woods or Laguna Niguel? All-on-4… What is it? and Can it help my smile? I am interested in All-On-4.